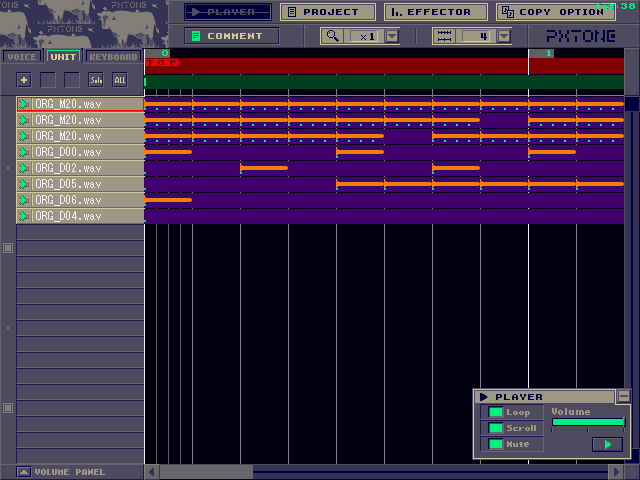 Have you ever wanted to know how to visualize Cave Story music, like how music of other formats (NES, SNES, C64, etc) are in Sidwiz2, like certain tracker artists (one notable artist who often uses the program being RushJet1)? 1. Concurrently, as of OrgMaker 210's release, until an update to OrgMaker comes into fruition, there is no "Convert to .wav" feature implemented in the program, meaning this process will take longer than needed! 2. This whole process will be time consuming, if you don't know what you're getting yourself into. For those who are familiar with SidWiz, you'll need to create .WAV files of the entire song itself, as well as each individual channel that will be visualized on the resulting video. 3. Make sure to have plenty of space on your hard drive, as you'll be using .wav files, which can consume space if you're not too careful. It also depends on what format you want the resulting video to be saved as! 4. If the loop of the song is in the middle, and it is not pretty lengthy, make sure to copy and paste the looped section in OrgMaker PRIOR to doing this whole mess, as Org-Ptcop Converter only saves the first loop! Now to begin our adventure! Step 1 - Open the org of your choosing in Org-Ptcop Converter and turn it into a .ptcop file. The example I'll be using here is my "In The Room" org. Once you've selected your org, click "Convert" and let's head to our next step! NOTE: Toggle the Drum Length in case you have any low instruments! It'll sound awkward if some parts sound cut off! That's a byproduct of converting with this program. Before heading to Step 3 - Now, the next part will be time consuming depending on how many channels you have in your song. Because the song was made with OrgMaker, the amount of channels will vary. Wave instruments can range from 1-8, but percussion instruments can range from 1-6 (NOTE: If the song you made was made for a Cave Story mod that uses the Orgkutsu/WAV ORG hack, then the percussion instruments can also range from 1-8). Step 3 - Mute all but one channel, and use the "Export .wav" feature. Make sure you have the "Enable Units Mute" checkbox marked so it can save the .wav file playing only that channel that's selected. If you have an odd number of Wave channels and Percussion Channels, make sure to mute all channels so you can make a silent .wav file. Once you're finished, unmute all channels and export the song in its fullest as a .wav file. The numbered files representing the wave instrument channels, and the lettered files representing the percussion instrument channels, following the QWERTYUI format seen in OrgMaker (pictured), to keep things organized and easier to remember. Silence and full song files should be there too. Step 7 - Repeat Step 6 for all channels. NOTE: You do NOT need to turn the full song file into a mono track! Step 8 - Now for the fun part! Open up Sidwiz2 and modify the voice amount and distribute them evenly, depending on how many channels there are in the song. Once you've done that, put the full song file in for the Master Audio File, and place the individual channels in the layout manager. Color them however you want, if you want it to look more clean and make the wave instruments distinct from the percussion instruments, use two colors for the types of channels. HELPFUL HINT: If you have an odd amount of channels and you wish to separate the waves from the percussion, this is where the Silence files come into play! Color them black so they wouldn't be visible, and it'll make the grid look more like a grid if you have the "Grid" option checked. Step 9 - Save the .mkv video file and choose a video compression type. Personally, I prefer using the Lagarith Lossless codec, in case you don't know much about video compression and you're interested in which one I use. Click here to download the codec! 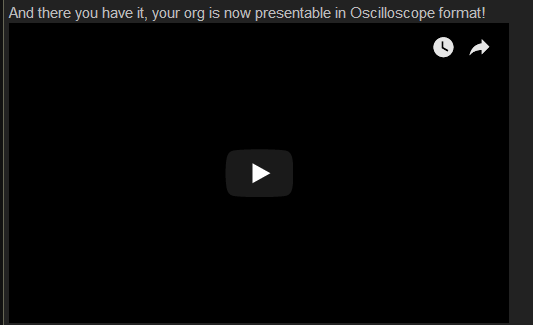 And there you have it, your org is now presentable in Oscilloscope format! Like I've said in the beginning of this tutorial, you'll need to make time for this, as doing all the steps can be considered tedious and time consuming. Hopefully if there is a "Convert to .Wav" feature implemented in a future update for Org Maker, then I will rewrite this tutorial to accommodate to the potential ease in steps that are required. In case you're not satisfied with how the resulting video looks (I know I'm not with the example, but again, this is all for testing purposes), you can easily tweak the line width and the wave scaling in Sidwiz for improving its appearance. Thank you for following this long tutorial, I'm now going to rethink the past 2 hours I've wasted writing up this tutorial. It's been a while, but I have brought some more useless, yet very informational stuff to those who do dare putting Org music through Sidwiz2. So there's this feature you can use called "Alt Sync", which helps sync up the more complicated waves to the center. And given the WAVE100 has quite the number of complicated waves, I thought of creating a table to show which waves need it, and which don't. And to my surprise, only four of them cannot even be synced in either format: Waves 48, 64, 69, and 71. Another thing to note is that of all the notes that can be synced normally, only one of them is allergic to the alt sync: Wave 23. Of course, I doubt Rushjet would look into this, but since most people use Sidwiz2 for songs of various soundfonts (Atari, SID, NES, SMS, SNES, MD, GB, GBA), it'd be helpful for whoever decides to play Org music through an Oscilloscope style video.